John Harbison's "Mottetti di Montale"
First performance of the complete work in 20 years. Dream team: (left to right) Kelsey Lauritano, Lydia Brown, John Harbison, Chloë Schaaf, Simone McIntosh, and Anne Wright. Thayer Hall, Colburn School, June 9, 2017. John Harbison on his Mottetti di Montale, poetry by Eugenio Montale. Thayer Hall, Colburn School, June 9, 2017. The American SongBook Concert with director Amy Burton. Thayer Hall, Colburn School, June 30, 2017. 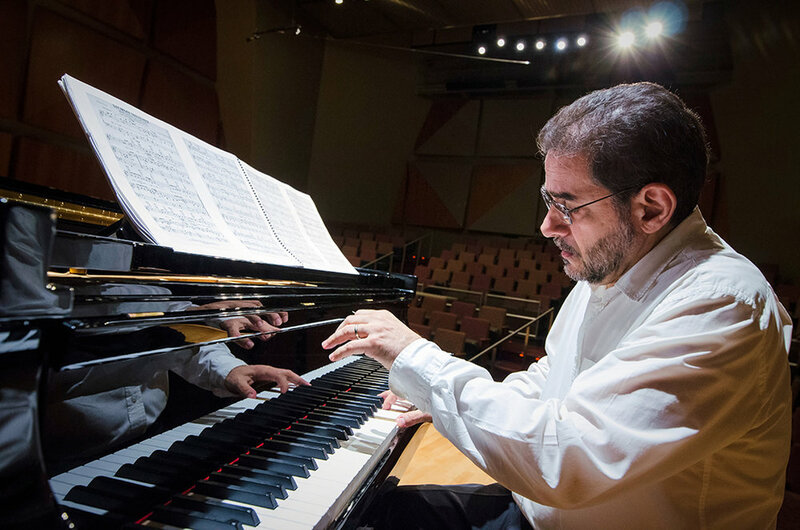 Pianist and composer John Musto with his breathtaking playing at SongFest 2017. Thayer Hall, Colburn School, June 30, 2017. 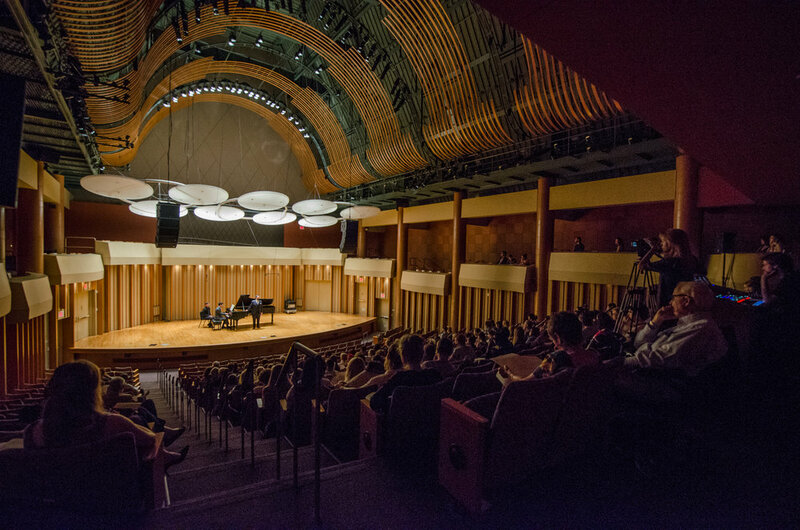 LA Composers Concert in Zipper Hall, Colburn School. Rosemary Ritter, Emily D'Angelo, Liza Stepanova, Matthew Morris, Kristina Bachrach - December 6, 2015. Post concert photo with winter intensive participants and faculty including Sir Thomas Allen, Graham Johnson, Susanne Mentzer, and Stewart Robertson. 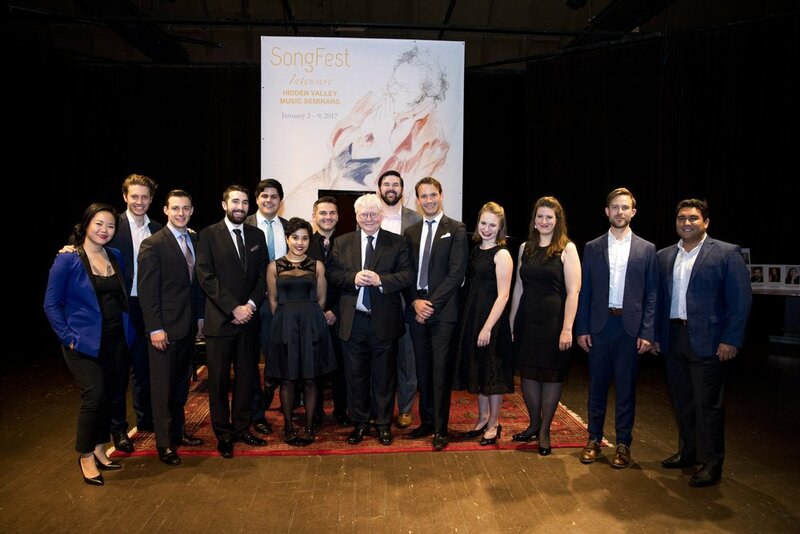 SongFest comprises of three (3) programs for singers at every stage of their development: Studio Artist, Young Artist, Professional Fellow and Pianists, from freshmen to professional recitalists. A rigorous art song program with over 20 internationally distinguished pianists, singers, composers, and guest artists give daily thematic master classes, and private coachings in their area of expertise: covering the breadth of art song from lieder, to mélodie, to art song. Whatever your interest in song repertoire, encounter new exciting repertoire, new music from our resident composers, and build relationships with fellow art song enthusiasts that will last a life time. Read more about upcoming concerts – click HERE. In words and music MARTHA GUTH, soprano and GRAHAM JOHNSON, piano trace the metamorphoses of four composers from their youthful to their later creations. Songs by Schubert, Fauré, Poulenc, and Britten demonstrate how young composers gradually evolve from their early beginnings to mature mastery. To read more about the Schubert Class Series – click HERE.